Welcome to Silversands, one of the most luxurious resorts in Grenada. Perched peacefully on the calming shoreline of Grand Anse beach in Grenada, you will discover the luxurious 4-bedroom beachfront villa. This newly built villa is part of the famous and sought-after resort Silversands. 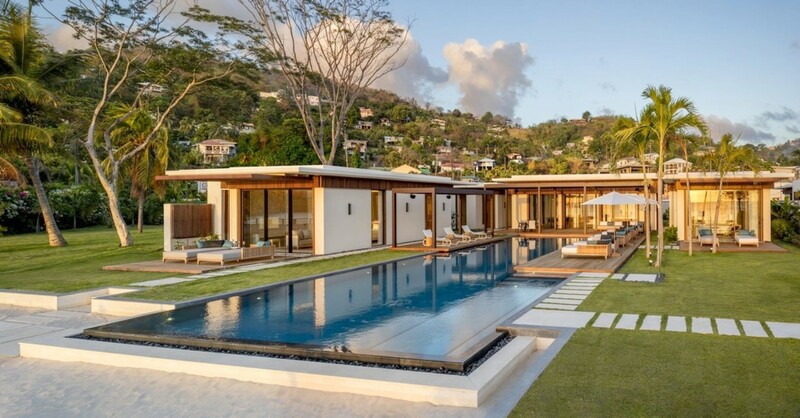 The property can accommodate up to eight guests across its lavish interiors and expansive exterior living space, expanding over a total of 2,200 Sq. meters. With a profusion of first-class amenities and friendly staff at hand 24/7, this is the perfect Caribbean getaway with seamless five-star luxury. Silversands is a brand-new luxury resort that is located directly on the Grand Anse beach, one of the nicest beaches in Grenada. This beachfront location offers incredible views across the crystallized Caribbean Sea. Wake up each morning to a view of endless blue hazes. The beach enjoys calm waters and soft breezes. Silversands location is perfect for a morning stroll as the water laps onto your toes, or an evening relaxing on the powdery sands as you stargaze. Staying in the beachfront villa caters to all your needs, while also allowing you full access to the resort’s amenities. The resort features an iconic 100-meter pool that is one of the largest on the island. You can even unwind in the incredible stellar spa or dine in the hotel, tasting the tantalizing Caribbean cuisine that is hand-caught and locally sourced. Making your way to the seclusion of your villa you will notice the large water fountain at the villas main entrance. Opening the double doors, you will instantly find your eyes falling on the panoramic ocean views ahead. Walking into the main living areas, this open plan room blends the living and dining room into one spacious Great room. The interiors are laced in handcrafted furniture and fitted with light colored oak floors and soft-tone stone. Light floods the room through the ceiling to floor windows and bounces around the room’s pristine walls and furniture. The dining table seats ten guests and the living area is fitted with plush sofas and lounge chairs. Behind the dining area is the glistening modern kitchen, fitted with pristine cabinetry and marble counters. The kitchen comes fully equipped and ready for you to use during your stay. Attached to the kitchen are an additional powder room and service pantry with separate entrance. Main living area seamlessly transitions onto the covered terrace, creating an airy and light atmosphere inside. Each of the Beachfront Villas are designed as an individual pavilion, creating a private and secluded hideaway for you and your loved ones. The terrace and landscaped gardens have direct access onto the sugar-fine sands of Grand Anse beach via the private path and stairway. In the morning you can slip into the refreshing waters of the private infinity pool or perch yourself on a comfortable sun lounger and you sip on a freshly brewed cup of coffee. Set yourself into holiday mode as you exhale and let go of your stresses, breathing in the fresh saltwater air. Dine alfresco beside the pool as you experience this island style living. Lounge out on the sunbeds as the day gets warmer or perhaps pack a picnic and spend a day directly on the beach. You can always return to the seclusion of your private terrace and listen as the rhythmic sounds of the ocean lull you to sleep. This four-bedroom beachfront property boasts incredible ocean views and caters to all of your needs. Unwind in the serenity of this villa as you indulge in an authentic vacation with the beach as your backyard. It’s time to book your next Caribbean getaway. Bedroom 1 Master: Luxurious King-sized Bedroom, Private En-suite Bathroom, Large Bathtub, Shower, Two Single Vanities, Walk-In closet, Lounging sofa, High-resolution TV, Access onto a private terrace, Sun loungers, Panoramic Ocean views, and access onto the beach. Bedroom 2: Luxurious King-sized Bedroom, Private En-suite Bathroom, Large Bathtub, Shower, Dual Vanity, Walk-In Closet, Lounging sofa, High-resolution TV, Access onto the private pool terrace, Sun loungers, Garden Views. Bedroom 3: Luxurious King-sized Bedroom, Private En-suite Bathroom, Large Bathtub, Shower, Dual Vanity, Lounging sofa, High-resolution TV, Access onto a private terrace, Sun loungers, Panoramic Ocean views, and access onto the beach. Bedroom 4: Luxurious King-sized Bedroom, Private En-suite Bathroom, Large Bathtub, Shower, Dual Vanity, Lounging sofa, High-resolution TV, Access onto the private pool terrace, Sun loungers, Garden Views. The luxurious 4-bedroom beachfront villa is based in the five stars, newly built Silversands resort in Grenada. The villa is based on the shoreline of Grand Anse beach along the coast. Silversands is a luxury resort that offers endless views across the crystallized Caribbean Sea. Grenada is a vibrant Caribbean Island that encompasses the main island and a variety of smaller islands. The main island is laced in nutmeg plantations and so the location earns its nickname the ‘Spice Isle’. Grenada offers a pure lifestyle and an authentic, relaxed vacation setting. This captivating island boast of silky beaches along the coast with sugar fine sand beaches, coral-fringed waters, and unobstructed landscapes. The island features a variety of water sports activities, such as sports fishing, scuba diving, and snorkeling. Explore these colorful coral reefs, spectacular shipwrecks, exhilarating drift dives, and a unique underwater sculpture park. Grenada has over 50 sites of intriguing underwater sites to delve into. There are also many exciting historical sites and nature spots for you to discover. All rates are in US Dollars and 10% VAT and 10% Service Charge is NOT INCLUDED.